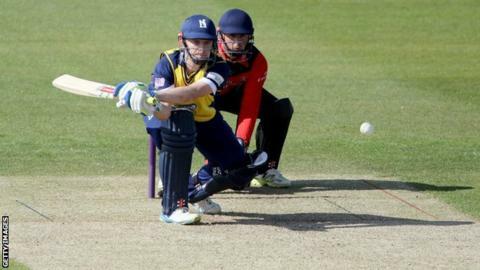 Warwickshire batsman William Porterfield says he hopes his one-day form will give him the chance to get back into the Bears' Championship side. The Ireland captain, 30, struck a century as Warwickshire beat Sussex on Monday to stay in the hunt for a quarter-final spot in the One-Day Cup. "We're going well in red-ball cricket and you've got to get runs to get back into the side," said Porterfield. "I feel in decent nick and I've just got to be ready for the opportunity." Porterfield played the last of his four Championship matches in the Bears' defeat by Durham in late May but, with the side third in the Division One table, he understands why it has been hard getting another crack. "When you're winning and playing good cricket, then you can't complain," Porterfield told BBC Coventry & Warwickshire. "All you can do is look after your own game and make sure that's in order for when that opportunity comes along. "It's a long season and we've still got four big games left in the Championship to go as high as we can." With the Bears now 50 points adrift of Yorkshire in the Division One table and having played a game more, their most realistic chance of silverware comes in one-day cricket. The defending T20 Blast champions have clinched their place back at Finals Day and know a win against Kent in Wednesday's last pool game should see them through to the quarter-finals of the One-Day Cup. "We're playing well and winning games in all formats and up there in all competitions," added Porterfield. "When the side's like that you've got to stay on top of your game."